Sail into the Great Bear Rainforest and see the all-white spirit bear! 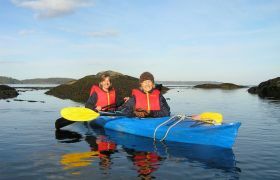 See grizzlies, black bears and humpback whales and learn from native Kitasoo & Gitga'at guides and explore saltwater estuaries. 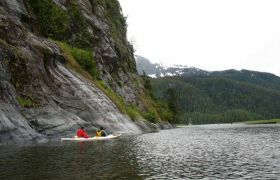 The central coast region of British Columbia’s scenic and intricate shoreline has a long history. 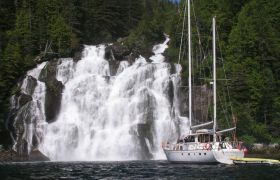 Stretching from Vancouver Island, north along the mainland coast, it forms a significant section of the famous “Inside Passage” route to Alaska - a name that started with the gold rush of the 1800’s. 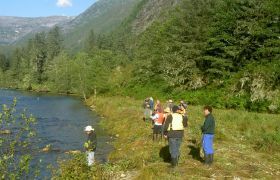 Many of the gold seekers stayed on the coast, attracted to the plentiful resources of fishing and the lush forests. Native peoples have lived along this coast for at least 10,000 years, and built a renowned culture based upon these same fish and trees. Unfortunately, diseases spread from the first European settlers, decimated the old villages, and now the native peoples are centred in a few, small coastal villages - Bella Bella, Klemtu, and Hartley Bay. 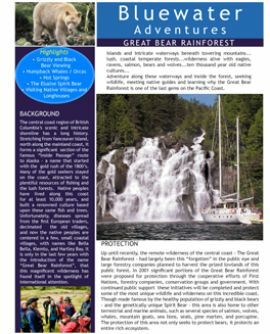 It was only in the last few years with the introduction of the name “Great Bear Rainforest”, that this magnificent wilderness has deservedly found itself in the spotlight of international attention. 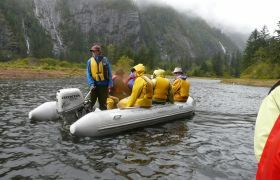 A coastal British Columbia nature cruise that will take you to remote areas of Canada’s Inside Passage. 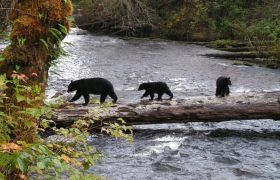 Search for grizzly bears, black bears and an excellent chance to see a Kermode/Spirit bear with permission from the local Gitga’at, Kitasoo/Xai’Xais, and Haisla First Nations. These primeval forests are the only habitat of the Kermode or “spirit” bear - an elusive and rarely seen wonder. 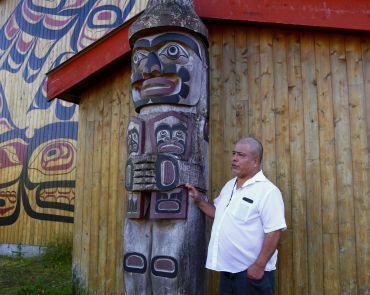 With respect for the local cultures, Bluewater share’s a portion of revenues with local communities and has committed to Protocol Agreements with coastalFirst Nations. 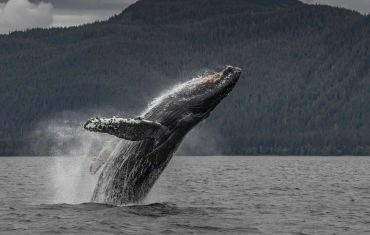 We often see spectacular humpback behaviour such as breaching, and a cooperative feeding technique called ‘bubble-net feeding’. 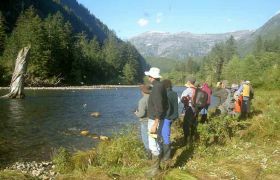 We visit and explore this incredible area with permission from the local Gitga’at, Kitasoo/Xai’Xais, and Haisla First Nations. 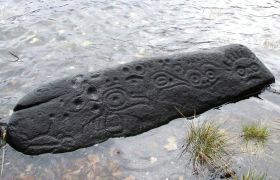 In the concept of eco-tourism visitors respect local cultures and share a portion of revenues with local communities. 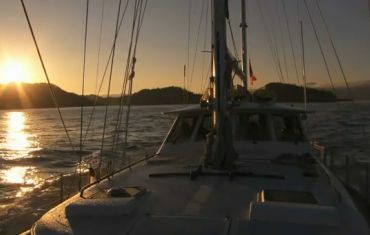 Bluewater Adventures fully supports this concept and has committed to Protocol Agreements with all these First Nations. We plan to spend a day with local Gitga’at guides who will share their culture and history as they guide us to their favourite bear viewing sites. 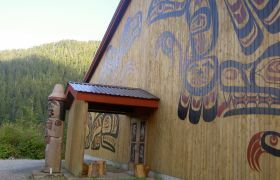 We also make efforts to visit the newly built Big Houses in Klemtu or Hartley Bay. 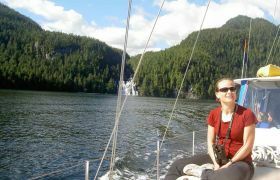 These primeval forests are the only habitat of the Kermode or “spirit bear”. An elusive and rarely seen wonder, the Spirit Bear is a genetic throwback - a black bear with a “recessive” gene for snow-white fur. Princess Royal Island is one of the few areas on the coast where one can find the Kermode. Only 10% of black bears in the area are white, so though we expect to see black bears, it will require good luck and perseverance to spot a Spirit Bear. 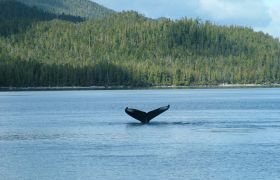 During our voyage there are excellent chances of seeing various species of marine mammals. Campania Sound and Whale Channel are good areas for viewing humpback whales. We often see spectacular humpback behaviour such as breaching and a cooperative feeding technique called ‘bubble-net feeding’. 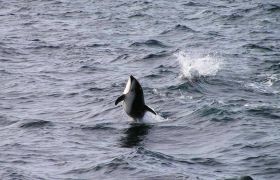 We sometimes encounter killer whales - these would be the marine mammal-eating sub-species (Biggs) that have a wide range of travel in pursuit of food. This area is home to the magnificent grizzly bear, a species that requires large areas of habitat undisturbed by human activity. 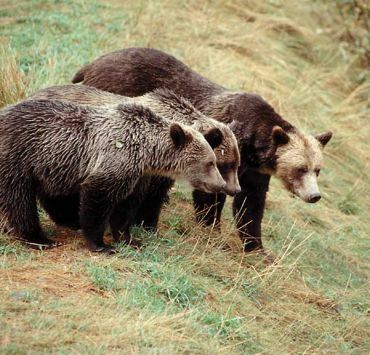 These great bears, once roamed across North America but due to the advance of civilization, diminished food supply and continued hunting, they are now threatened in their remaining range. 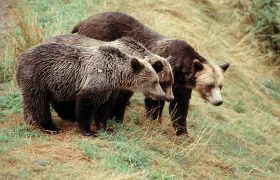 Weighing in at more than a quarter of a ton, grizzly bears sit at the top of the food chain and are a critical part of this coastal ecosystem. 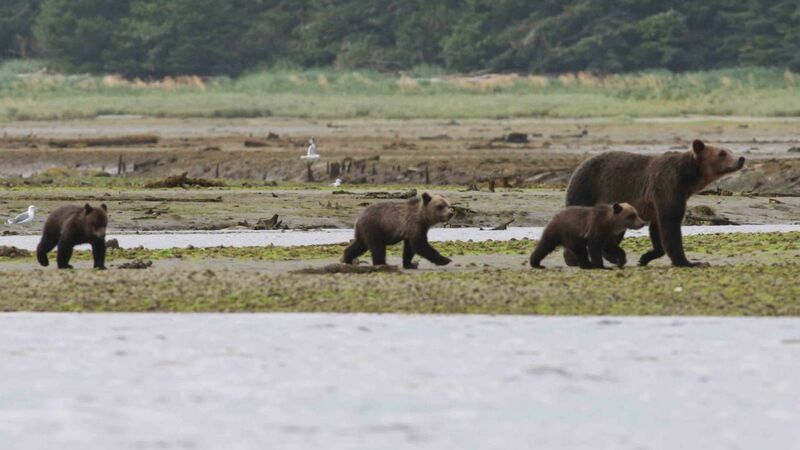 These bears are drawn to the estuaries of large coastal rivers to feast on the salmon moving upriver to spawn. They depend on these salmon to survive. 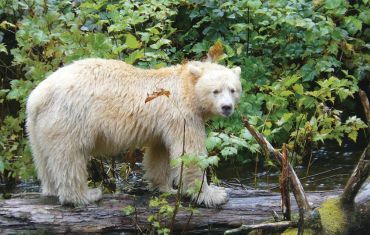 The Great Bear Rainforest supports one of the last sustainable populations. 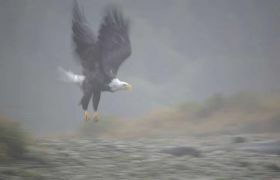 We plan on exploring up remote coastal fiords and expect to see these majestic creatures. This brochure highlights the history, ecology, wild life and native culture. 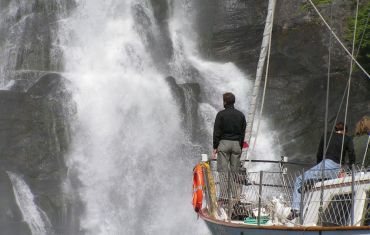 Our daily plans are flexible to accommodate the surprises that we encounter each trip, the requirements of tide and weather, and the interests of the group. With so many opportunities to be “wowed”, it’s hard to predict what unique moment will be your favourite memory. 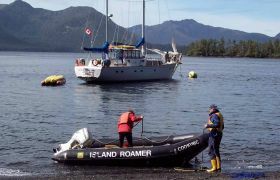 Day 1 - We meet at the top of the Municipal Dock on the Bella Bella waterfront and leave mid-day to begin our adventure. Note: some departures begin/end in Prince Rupert. Days 2-7 - Over the next 6 days, we will travel to a number of areas around the Central Coast such as Campania Sound and Whale Channel - excellent areas for spotting humpback whales and Steller sea lions. 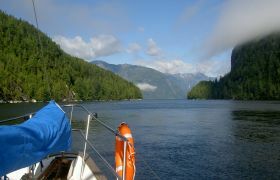 We may go ashore in the Gitga’at (Princess Royal Island) Conservancy. 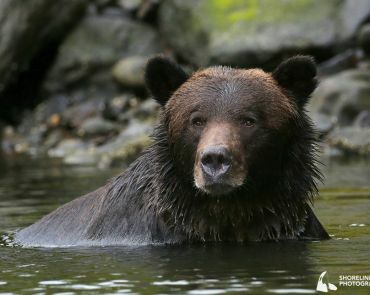 We will cruise over to Bishop Bay to enjoy a relaxing dip in the hot springs and spend a day with a Gitga’at native guide, taking us to his favourite bear viewing area. 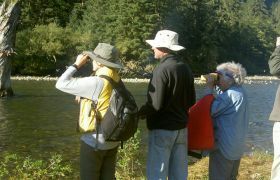 With patience and some luck we will see black bears and the elusive, white Spirit Bear! 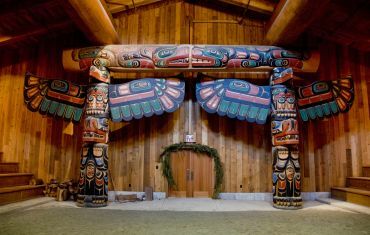 We may visit the First Nations village of Klemtu or Hartley Bay to see their ceremonial Big Houses. 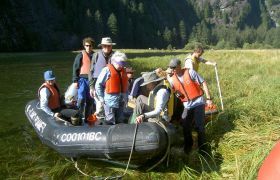 We will voyage deep into the coastal mountains to explore the Fiordland Conservancy where, beneath towering rock bluffs and waterfalls, we will search remote estuaries to see grizzly bears feeding on spawning salmon. Day 8 - We arrive in Bella Bella late morning. Participants can catch the Pacific Coastal Airlines late afternoon flight back to Vancouver. Includes: daily activities, travel details & accommodations details.